The United States Men's National Team was firing on all cylinders against a depleted and disorganized team of Cubans last night in the cozy environment of RFK Stadium. The stadium's notorious supporters of DC United were joined by a crowd of over 20,000 bouncing fans. The US scored in droves, but the true star was DaMarcus Beasley who put on his best display since returning from reconstructive knee surgery. 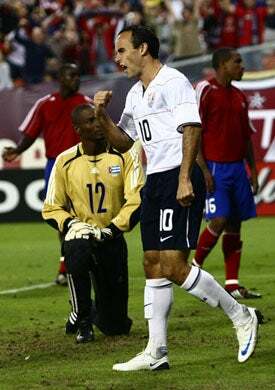 The 6-1 victory over Cuba not only secured passage to the final round of qualifying for the 2010 World Cup, it provided a stage for DaMarcus Beasley to exhibit his dynamic skills on the international stage again and for Landon Donovan to orchestrate the attack with blinding results. It allowed Jose Francisco Torres, a Mexican-American midfielder who had his choice of countries to represent, to make his debut, for Potomac's Freddy Adu to contribute close to home and for Olney's Oguchi Onyewu to cap a stirring second half with a late goal. The Americans improved to 4-0 in group play, and with two inconsequential matches remaining, Bradley can test young players and expand his player pool before the six-team final round begins in February.